And so, this little soda arc comes to an end. I’m not even going to pose any questions to you readers this time since y’all have given me so many awesome ideas over the past few strips for the next time I see a soda machine or soda fountain. Also, I need to keep this short as it’s crazy windy here in West Hollywood tonight. The power has already gone out once and I don’t want to tempt the fates by keeping my computer on any longer than needed to post this strip! Logging off. See you tomorrow. Soda – not for me! heheh. well, you can live vicariously through the strip, Peg! As a diabetic, soda is no longer on my foods list. this is one of the reasons why i’m trying to not indulge my soda habits too much, lately – it runs in the family and i don’t want to get it! Yeah, I’ve watched friends do this all the time. Some get the earlier spit-take reaction, others get the wide “OMG” eyes. Either way, soda is such an interesting thing to play with. I’m not brave enough to do this most of the time…but maybe I’ll start trying a couple choices. Stick my toe in the water, so to speak. be brave, T! actually, there are SO many healthier options than soda, so if you aren’t addicted yet, run away and don’t look back! it’s too late for me, i fear. And tea is so relaxing, especially when you take the time to really steep the leaves and breathe in the smell while watching the sun rise/set. Mmm. Tea. mmmmm i love the tea in winter lol speaking of habits dont get into wine becoming a wine-o is quite addicting and trying to become a connoisseur of it is expensive! thankfully, while i love wine, i’ve never gotten addicted, MrSnow! i pretty much only love red wine, though. white’s just kinda okay. wow. do you have a name for this mix, MrSnow? Typical. When one thing finally goes right, you have no idea how you accomplished it. *Sigh* Life is hard. Nice… Now I wanna taste it :C to the soda dispencers for experiments! Oh Sorry I mean *ahem* Good Morning BOTiverse! morning, Pixie! and, yes – there are so many food and drink concoctions i’ve just thrown together, with no idea how i’ve gotten to the final product. I gotta find me one of these machines in the Philly area. Someone at work was talking about finding one but it wasn’t anywhere near where I live or work, darn it. here in L.A., i’ve only found ’em in movie theaters and supermarkets, TPC. hope you find one so you can do some mixin’! http://www.coca-colafreestyle.com You can find a google/map of all of them near you! sweet! extremely handy tip, Descolada! pardon jeffbot I’ve been a long time reader off and on and i’m about to disappear again for what may be a few months while i move. your comic has been on my mind of late and ive began to ponder a small handful of questions. the firsts not a question but i would like a reply if possible. allot of your arcs seem to build of each other even when they seem to be small disruptive arcs like the “soda craze’ that built up to “soda addiction’ and eventually to this small arc while the writing is good as usual i cant help but feel it wasn’t intentional. another question raised is of missing characters.. perhaps I’ve missed the arc where Cel returns but she seems to have fallen from the table so to speak, along with her shop which allot of detail and possible story, gimmick and general jokes could be found at as starting points. what id like to know is… is she going to make a come back and/or will he (jeffbot) do a moving on of sorts. the next is the super hero strips seemingly one shots… are they setting up back story of apparent one-sided goodness for when he goes rogue super (?) on the community? I ask because the “alien”scarf seemingly starts a dramatic shift in Jeffs behavior from neutral to that of a more sinister or perhaps authoritative perspective with such instances as the corn fathers leaving and his ” tetris loading skills” and even giving his sister quips that would otherwise be badly received are now instead treated as an loving hug. so, firstly, yes: the arcs do build off each other. sometimes i don’t even know when something’s going to become an arc when i first start it. it’s really just the nature of the “creative process” or whatever you want to call it – once i have an idea, my brain just sort of builds and builds on it. 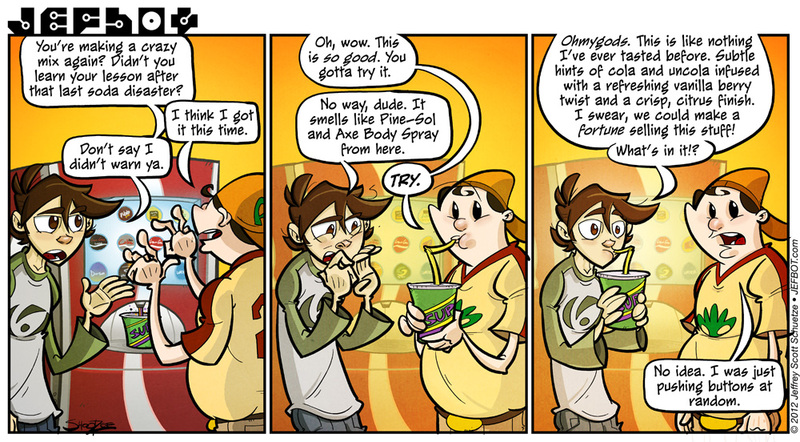 believe me, i probably could’ve gotten 10 – 20 strips out of the “soda” idea alone, but i distilled it down to 4, which is probably the best decision for all of us. heheh. as far as the missing characters go: yes! i have big storylines planned for cel, Musashi and the Angry Scarf, but i just haven’t had a chance to tell them, yet. a lot of things have been going on lately with work, conventions and misc. life stuff, and i don’t want to get into another mega-arc until i have time to really do the next storyline (which will be a biggy!) justice. stay tuned. that last Angry Scarf storyline does set up some fun stuff for bot to do in the future, but i doubt he’ll ever go full-on “superhero.” no doubt we’ll see him try, though. i can relate, digit: i worked at a fast food joint for a while while i was in college and the free sodas were definitely the best perk, as everything else – while discounted – cost the moniez. Get it to Cel—she’ll analyze it. Ooo—or give some to Angryscarf and Level Up like whoa. yes, WHO KNOWS what that mix would do to the Angry Scarf, Sarah W!? bot could probably rule the world. Darnit, this is another one of those things I wish they’d turn into some kind of smell form! heheh. i remember there was a device that would turn images on the ‘net into smells, JR, but sadly, it never caught on. probably for the best when you consider all the gross/icky/disgusting web videos out there. i do the same thing, dj – it’s amazing the various leftovers that you can jam into a tortilla. Some of the best discoveries come about by accident, and I think if we were better at retracing our steps, we’d have a lot more of them that we could replicate. I’ll bet Silly Putty was made dozens of times before someone could remember exactly what they did. well said, E. A. Setser – this kind of thing happens in science, nature and art all the time. in fact, some of the best things about JEFbot have come about due to happy accidents! Its funny, that I make drinks for friends.. They always ask me to make them a new alcoholic drink. Most of them I’m told are delicious, but I don’t trust myself so I don’t dare drink my creations unless they don’t die within half an hour of consuming it. I usually remember the ingredients though, and had to order one of those drinks for a friend at a bar… It was fun explaining how to make it to the bartender. heheh. i don’t think i’ve ever measured out any of the drinks i’ve mixed for myself or friends, which means i’ve made some terrible and/or really strong stuff. i don’t get asked much to be bartender anymore, go figure. Me: Now then, where did I leave that bottle of electrified toxic waste. Me: Well damn. There goes that batch of homemade Redbull. *gasp! * toxic waste energy drink!? that sounds like a recipe for superhero-making, Anime fan! SUPER SCRAWN, With Atmospheric powers and Anorexic infiltration skills. Remember kids, get your parents permission before ordering a toy that has not been put into development, R&D, or may even possibly cost more than their own house. Just another one of those things where you succeed when you’re not even trying, but couldn’t do it again if you tried a thousand times. when i was a kid learning to draw, i’d occasionally draw something awesome (to myself, at least) and then spend the next several hours trying to duplicate it, to no avail, Fijiman! i didn’t think i’d like Lime Coke (or Orange Coke, for that matter) but they were surprisingly good, Ewitwins! awesome you have one on campus. Ewwwww you have Cornfather cooties now! Yes, this. Replace Jefbot with me and the CF with Taranchilla. He always does it totally at random, so it is never the same drink twice. It’ll have lemonade, coke, Dr Pepper, Poweraid, Sprite, and whatever else is on tap. Yet sometimes, against all odds, it actually tastes *really good*. Our youngest does this all the time, and tries to get the wait staff at restaurants to do it for him as well. oh, man – putting mixes in the hands of others is an even riskier move, Oz! hopefully your youngling hasn’t been too disappointed most of the time. I am physically incapable of drinking Pop/Soda/Whatever. I’ve tried before, and it never goes well. It’s not nearly as bad as Mike, but it seriously feels like I’m going just short of drinking acid whenever I try the stuff. heheh. it’s probably cuz soda’s so bad for you your body’s just completely rejecting it, Radiovid. would that my physiology had evolved to that level. By the looks of the strip, it seems SOMEBODY has been to Firehouse Subs recently. And I usually just put in a spritz of Orange Mello Yello and Peach Mello Yello before drowning it out with the original. Gives it a nice citrus flavor and makes it a little smoother to boot. If Whoopi Goldberg says give five, what if you were able to give just 5% of a days income from this site for the people effected by Hurricane Sandy? Or just a week, from the ad revenue?